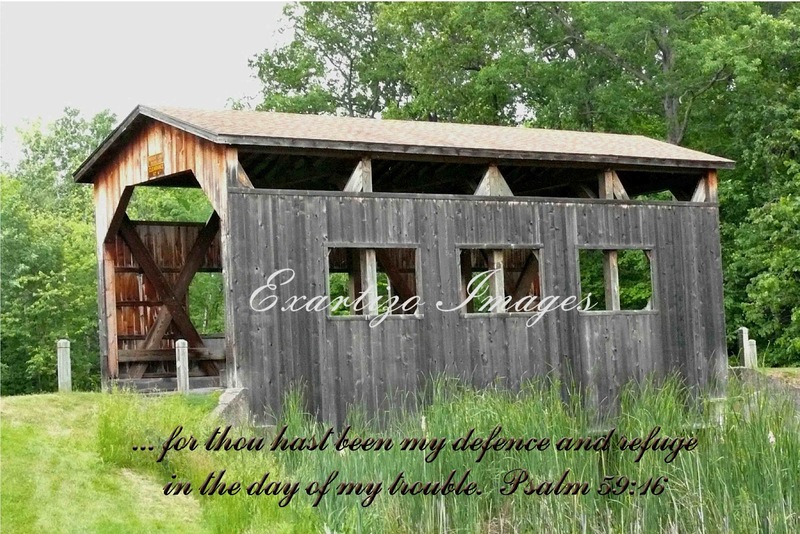 Exartizo Images: WHAT IS YOUR REFUGE? I love the covered bridges. They were used in the days of horse drawn carriages. When a bad storm was brewing folks could pull their wagons in and ride out the storm. It would protect them from the wind, rain, snow and the sun on very hot days. I imagine it was a life saver. The Lord can be this to us. He is always ready and willing to be our defence and refuge in the day of our trouble. There can be some very nasty people out there. No matter how kind you are or how hard you work, they will treat you bad. What you don't want to do, is sink down to their level. We as God's children are above all that. When we "react" to their sin, we walk outside of the Lord's protection. We have all had people treat us with less then kindness. Sometimes, it will be a fellow saint. That is usually the easiest to deal with. It won't take them long to realize they are wrong and they will repent. This is where you move on with forgiveness. Now, if you are dealing with pure evil intents, those that want to persecute you, this is when we run for refuge. Have you ever dealt with these kind of people? The kind that enjoy saying really mean things about you and will spread nasty rumors far and wide and they have no remorse? How about those that enjoy watching misfortune come your way or, will laugh at your calamity? Sometimes, I actually feel sorrow for them. I think how sad to have such darkness in their heart. They don't have the joy of walking with the light. Actually, I mentioned above that we "run for refuge". You don't have to run very far, He is right by your side. Let Him deal with these people, keep your heart at peace. He will find a way to correct them and get them off your back or out of your life. But.....be patient! Don't step outside of His refuge and try to handle it yourself. Wait.... for His wisdom. You may not need to do anything ( I have seen this in my own life. Many times those of evil intent will fall of their own accord). Sometimes the Lord will give you specific wisdom on what you need to do. You, just keep the word in your heart and fellowship much with the Lord. Don't fret, He is on your side. Don't get tricked into trying to handle it on your own. One way this can happen is if we think too much about the problem. Look at it this way; it is actually not your problem, it is their problem. They are the ones that can't handle the light in you. You know you will come out being the winner. What do you have to worry about? Thinking this way makes it real easy. Click here to purchase the above image as a downloadable greeting card. Click here to purchase the above image as framed art. Nice photo of the covered bridge. We have three very old ones all within about ten miles of our home. Regarding these types of people, I ignore or avoid them, but pray for their enlightenment.